How will a new generation of leadership change our field? How will a new generation of leadership coming into our field change it? In 2014, the Metropolitan Consortium of Community Developers (MCCD) celebrated its 25th anniversary. The anniversary’s theme was “past meets future,” a year-long process celebrating the beginning of our organization and envisioning where we are headed. The whole staff was involved throughout the year, excited to share our work among a large group of members, peers, and partners. Having everyone focused on MCCD’s past and future throughout the year generated many meaningful conversations, including some that were difficult. At the time, I was in my late twenties and had been working at MCCD for a little over four years. Having recently completed a graduate degree in urban and regional planning and done a short stint in direct service with the Housing Choice Voucher program, I was eager to impact public policy around community development to create places of opportunity for low-wealth individuals. At MCCD, I was supported our member-driven public policy agenda and coordinated peer-to-peer learning. One of my favorite roles was leading and developing our Emerging Leaders in Community Development program, a group of early- and mid-career community development professionals who were eager to strengthen their networks, build their skillsets, and make an impact on the field. I quickly saw in them an energy and enthusiasm for community development that perhaps only people early in their careers can have, with optimistic visions of all that we could accomplish. I loved working with this group because they recognized me as a peer and provided honest feedback and a space to raise my voice. As someone relatively new to the field and a younger woman of color, I couldn’t always count on being heard when I wanted to share an idea. A space just for us emerging leaders provided the perfect environment for me and others to voice our ideas. This ready-made cohort of peers learned and grew together, becoming confidantes, sounding boards, editors, and co-conspirators for years to come. Thinking about the future of our organization and our field, we put our emerging leaders cohort forward to play a significant role in our 25th Anniversary Event. We had been doing what I believed was great work and now we could show our membership. MCCD was founded in 1989 founded as a consortium of community developers, not only to be a more unified and powerful voice but to start the local community development movement as we now know it. Our organization’s first board and staff members came to the field as organizers, agitating for change and improvement in the quality of life in their communities. They picked up skills along the way, how to write a pro forma, or put together a tax credit deal. All of MCCD’s member organizations at the time were place-based, traditional community development corporations. They fixed up problem properties, built new affordable housing, and cleaned up storefronts. This was more-or-less a recipe for successful neighborhood revitalization. When gathered, they would reminisce about the early days of the organization, share black-and-white photos of the groundbreakings of the first homes built in South Minneapolis, back when it was known as “Murderapolis”. They would laugh at failed deals they wouldn’t make again now, so many lessons, years, and projects later. While a few of those founders have retired, some are still on our board today. Some are elected officials. Many are executive directors. They can claim thousands of affordable homes built, small businesses started, entrepreneurs coached, neighborhoods strengthened, and commercial corridors grown. They have an incredible record of success for future generations to build upon. The emerging leaders enter the Twin Cities community development field as passionate and entrepreneurial students of that history, working with the legends we studied in graduate school while simultaneously blazing our own paths. Many of us enter the field through a lens of local case studies. 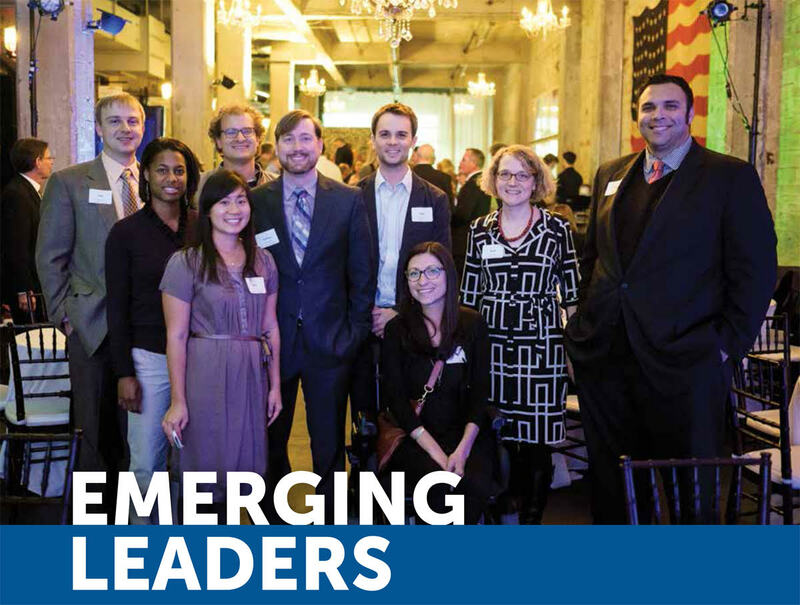 We emerging leaders take graduate-level classes called Private Sector Development and Financing Affordable Multi-Family Rental Housing. In our first community development jobs, we learned our organizations’ business models and how they approached land acquisition and financing. At the same time, our emerging leaders are not here just to learn how to get things done. They want to be part of the conversation as peers who have something valuable to teach as well as to learn. They want a mentorship that is reciprocal, where their mentor finds the mentorship program to be valuable to their work too. I agree. The emerging leaders in our field are more diverse than previous generations. Many come to the field with knowledge from their previous work in social services, public health, and policy. They offer a new perspective on how to achieve neighborhood revitalization and how to define goals for success. They are open to experimenting with new models, pursuing cross-sector alliances with new partners, and delivering a new message about community development’s role. Just within MCCD’s membership, emerging leaders have spearheaded new asset management systems that have proven to be more effective and efficient, developed curriculum for resident leadership training programs, and helped to shape important housing policies at the local and state levels. There is a lot to agree on between the emerging leaders and the founders. We all value collaboration, we all believe that the communities we work with are exceptional places full of valuable assets, and we all want our field to continue to strive forward with creative and innovative solutions to today’s largest community development issues. And that means we constantly want to do more and to do it better. A healthy tension results between celebrating past successes and thinking critically about how to improve upon those successes. At MCCD, we have an ongoing series entitled, “Community Development Conversations.” These are gatherings to bring together staff at our member organizations and also our partners in local and state government, philanthropy, and the private sector to discuss pressing issues in our field and our region. Those local conversations mirror the same tensions I see sitting on NACEDA’s board and attending national events — tensions that emerging leaders are already stepping up to address by learning from generations past while bringing their own creativity and energy. Perhaps unsurprisingly, we talk about pushing our field to be more diverse and inclusive. At MCCD, only one of our original board members is a person of color. Ethnic diversity has long been a challenge in our field more broadly. The next generation of community development leaders has to push diversity and inclusion further — not just as a box to check but as an integral strategy for community improvement. I see emerging leaders doing this already, coming almost a full circle to return to the field’s community organizing roots. This is still where community development as a field should continue to draw inspiration and workshop opportunities for future projects. We need to ensure that our leadership not only represents the communities where we work but includes those very same communities. Our community leaders should be our board members, our staff members, our executive directors. We grapple with how to be developers but also be changemakers — processing transactions versus achieving transformation. Community developers have gotten very good at doing certain things. We build high-quality, affordable housing that cannot be differentiated from market-rate housing. We support thriving small businesses and invest in commercial corridors that our community members want to visit. Despite these successes, we aren’t doing nearly enough. Communities across the country are dealing with serious affordable housing crises. Community members are being displaced from neighborhoods where their families have lived or worked for generations. We are losing our “naturally occurring affordable housing” faster than we can build new housing. It can feel like we aren’t making progress. It can feel like there are more emergencies than opportunities. The context and the environment where we work, namely the policy arena, is changing too. This is especially true for local and state politics, where NACEDA members are most actively involved. There are younger candidates running for office, more women candidates, more candidates of color, and more LGBTQ candidates potentially double or triple the numbers in the past, offering an opportunity for potential allies. The new wave of elected leaders is responding to the same challenges that we see in our field and often have similar talking points. Our emerging leaders are the ideal people to be writing and delivering those talking points. And that can and should begin on the first day of a campaign rather than the first day in office. Our issues are increasingly top-level priorities for voters and we should own that knowledge by participating in candidate education and creating space for more conversations during election season to discuss policies that create affordable homes and prosperous communities. No matter how bipartisan our issues are, policy and politics are both important to our field and we shouldn’t be scared to participate in these arenas. This might mean hosting candidate forums or it might mean forming a 501(c)(4) to be more directly involved in elections. Determining our organizations’ roles can mean navigating a somewhat complicated landscape as nonprofits. We must acknowledge that when we aren’t participating in these conversations, other groups are — and they are controlling the narrative around issues that are important to us. If we do not tell our story, others will define us. How we talk about our field matters. Our minds and opinions are increasingly inflexible. You can see this when you read the comments to any online news article, no matter the topic. In a recent report on affordable housing messaging, The FrameWorks Institute and Enterprise Community Partners discuss the “backfire effect” — providing people with evidence that contradicts inaccurate beliefs can actually can make them double down on their original positions. We spend a significant amount of time collecting data, breaking down data, and discussing data as we attempt to win people over with the right combination of data and storytelling. Research has shown that this may not be as effective as we think. Our message may not win over the skeptics, who can often hold tightly to misconceptions about our field while preventing potentially successful developments from getting built or adding unnecessary costs and delaying timelines. Let’s try to meet people where they are and develop different communications strategies for those who are always with us, sometimes with us, and almost never with us. How can we get people to think about their own homes and their own communities when we talk about housing and community development? Addressing this challenge will mean thinking differently about our strategic communications. Seeing my peers communicate on Twitter, I recognize that we have the potential to drive new language, evidence, and arguments on behalf of our communities. We can combine new messaging strategies with political strategies that sow the seeds for a new generation of political leaders. By talking to today’s candidates about the need for stable, affordable homes and communities, we can influence tomorrow’s city councilors, state delegates, and U.S. Senators. It’s an area our emerging leaders are embracing as essential to our organizations, not something “nice” that should be funded only when resources are plentiful. The emerging leaders I know, both through our group here in Minnesota and through the larger NACEDA network of emerging leaders, are brave, courageous, and creative. We aren’t afraid of what we can’t do: that we can’t end homelessness or eliminate poverty or end racism. We know that our field is uniquely positioned to help address these issues. We are here to offer innovative ways to do that, even if it goes against some of the tried and true methods our field has relied on in the past. We are willing to challenge our lawmakers to think boldly and our philanthropic funders to invest more deeply and be our partners in these endeavors. Rose Teng is the public policy director for the Metropolitan Consortium of Community Developers (MCCD), the association of non-profit community development organizations in the Minneapolis-St. Paul metropolitan area. Along with the MCCD members, Rose helps to craft the policy platform and legislative agenda and works directly with local and state officials on implementing these policies on behalf of the membership. Rose also serves on the NACEDA Board of Directors. How a new generation of community development leaders will change the field is often one of those frightful questions founders and seasoned practitioners alike pose as the landscape around us shifts. Will their education and “book learning” over-shadow the “why” and, by extension, value of some of the field’s traditions? Is there a real understanding of who our trailblazers are? For instance, how many know who Diane Sterner is and why NACEDA bestows an award in her honor? What has been interesting to watch is the professionalization of the community development field. Opportunities from university degree programs to professional certificates have become major contributors to growing our field of emerging leaders. And for all that’s learned about the various technical facets of the work, I’m also convinced that building stronger, more intentional bonds with our elder practitioners can support the change offered by the new generation. There is local context—relationships, politics, culture, history, custom and tradition—that can be gained by drawing on the wisdom of those earlier leaders, much like what MCCD does. I got my start in this work in Kansas City, MO. There, I was fortunate to have leaders like Don Maxwell and Ken Bacchus to help me with both the hard and soft skills needed to be effective. For that I am eternally grateful, and still remain in contact. It is significant that NACEDA recognizes the need to support and even cultivate our next generation of leaders. There’s much work to be done; so many old battles we thought we’d won (segregation, fair housing, access to health care) have reappeared, layered on top of the ever-growing challenges of persistent poverty, racial and gender-identity intolerance, and economic inequity, to name a few. Our seasoned practitioners, who’ve been down these roads before, can be tremendous resources and able compatriots in the fight for the future of our communities. As our next generation of community development leaders assumes more positions of power and influence, and infuse their knowledge, passion and creativity into this work, I challenge them to make it a practice to build meaningful bonds with the elders of the field and stay grounded in the “why” of this work. Marla Y. Newman is community development director for the City of Winston-Salem, North Carolina, and a member of NACEDA’s Board of Directors. Just as our field is committed to comprehensive community development, so too must we be committed to comprehensive leadership development. As Rose mentions, that means encouraging and valuing leadership from a wide array of folks who work to ensure all communities are safe and equitable places. Community development necessitates collective leadership. The transformative roots and values of the field demand that of us. This is not a new path, but the slow work of consensus-building and growing relationships is indeed the road less traveled. It takes time and courage – bolstered by the long memory and wisdom of those who have blazed the path before us – to choose to make decisions and share power in less hierarchical ways. When I served in AmeriCorps through Public Allies, we embraced the idea that “leadership is an action many can take, not a position only a few can hold.” Following that maxim, we ask ourselves what we can do to encourage leadership development that supports everyone to lead when and how they can. I would wager that many community organizations already work in a way that is co-creative, responsive, and ultimately an outgrowth of relationships and sharing. And Rose challenges those of us who operate at the network level to imagine what cultivating leadership means for systemic change. Who is welcomed in crafting policy and making cross-sector decisions? What is the pipeline for leadership positions? How are we infusing justice, equity, and community control into our stances and practices? How does the field honor the leadership and wisdom of long-standing community champions? Our field must model collective and collaborative leadership at all levels, from the neighborhood block to the voting bloc. The way forward involves grassroots and inclusive civic leadership that is often difficult, messy, contentious, and contradictory. But it is wholly necessary. Jeremy Brownlee is membership director at NACEDA. What approach to our work seems to characterize the young people coming into the field? How is it similar or different from previous generations? What leadership strengths do the next generation of our field's leaders possess? Lack? What unique aspects of community economic development attract talented young people? What keeps them in the field?